It was George Bernard Shaw who once said: “Those who seek paradise on earth should come to Dubrovnik.” Such a ringing endorsement makes perfect sense to anyone who visits this town of approximately 40,000 people. Croatia’s hottest tourism hotspot – also known as the Pearl of the Adriatic – is famous for its walled Old Town, architecture, beaches, cuisine and cultural heritage. Dubrovnik also has an interesting place in history. As the capital of the Republic of Ragusa, it traded with the newly independent USA. It has also been reported that Dubrovnik was the first state to recognise the USA, in 1783. And, of course, to a more modern audience it is known as one of the filming locations for the popular TV series Game of Thrones. Look out for dragons! Cruise liners dock in Gruz port which is approximately ten minutes from the Old Town by bus. There are also plenty of taxis available for disembarking passengers. Don’t think about putting on your walking boots, however, as you’ll be looking at a 45-minute walk to the town centre. Gruz is a residential area with a renowned food market, a favourite among the locals, so passengers find might it useful to stop off and pick up some local supplies before continuing their journey. Friday and Saturdays tend to be the busiest days. 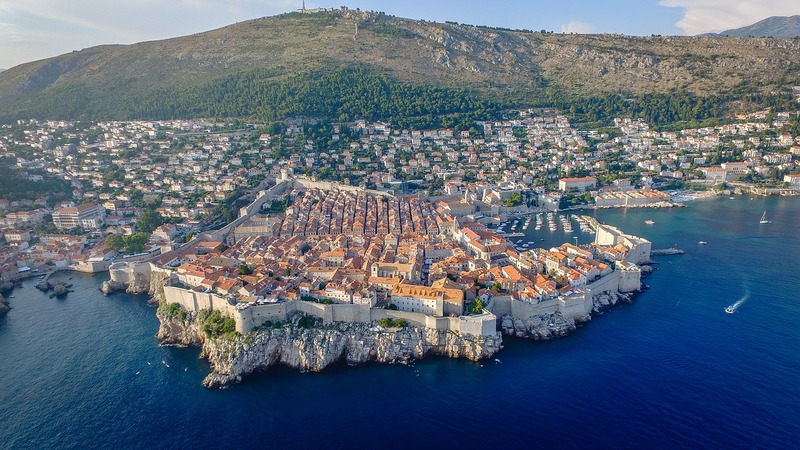 The Old Town: A stroll around Dubrovnik’s Old Town is a sight to behold. The UNESCO-listed area is bursting with Renaissance and baroque architecture, which is encircled by 2km of medieval walls dating back to the 13th century. The walls offer stupendous views of the town and surrounding Adriatic. Visitors might also find joy in navigating the Old Town’s narrow streets, with plenty of shops and restaurants to keep travellers entertained. Cable Car: The best views of Dubrovnik can be experienced by taking the cable car up to Srd Hill where visitors will see out onto the Old Town and the Adriatic Sea. The cable car, which was built un 1969, is very popular among tourists. There is also a Panorama Restaurant is on the upper station, providing a wonderful spot to take in the views while enjoying a glass of something delicious. Pile Gate: The main entrance to the Old Town is Pile Gate, the outer section of which was built in 1537 (the inner gate dates from 1460). In bygone days, the drawbridge was lifted every evening. It is at Pile Gate that Napoleon entered the city in 1806. Bota Sushi & Oyster Bar: Sushi in Croatia? May seem strange but Bota has quickly built a reputation as one of the finest restaurants in Dubrovnik – and the tiger prawn tempura is to die for. Nautika: Perhaps you’re paying for the location – and what a location it is overlooking the bay – but Nautika still serves tasty, classic European dishes at a steep, if not unreasonable, price. Lokanda Peskerija: Tasting fresh, delicious seafood doesn’t need to expensive, however, and this Old Town favourite will serve you the perfect pot of mussels. Gundulic Square Market: This open-air market in the Old Town serves up a whole host of sweet treats, including sweet-bitter arancini, dried figs, candied almonds and various liqueurs and brandies, as well as hand-crafted souvenirs. Maria Store: This is the shop to visit if you are looking for high-end fashion in Dubrovnik – with the likes of Givenchy, Valentino and Stella McCartney. Stradun: There’s no shopping street in Europe quite like the Stradun. Full of Dubrovnik’s famous historic charm – and dotted with charming little shops – this is a delight to stroll down. Dislike crowds? You might want to avoid visiting Dubrovnik in summer when the tourists can quite easily outnumber the locals! If you are planning a trip to Croatia then you may also be interested in checking out the latest ocean and river cruise news and our most recent cultural cruising features.